The Holetown Festival commemorates the anniversary of the first settlement of Barbados at Holetownin February 1627. Art is about the core elements of our lives, manifested in what we see, hear, taste, make, read and write, wear, and how we move. It is the creative footprint that becomes the discernible difference between people of different countries and experiences. It is a unique cultural trademark and the magnet that draws us to explore the corners of the world in search of those aspects of life that make us different from each other. It is the goal of the Barbados Summer Arts Festival to encourage the celebration of these seven elements that reflect our cultural identity and as we do so, to foster their development, allowing gainful and sustainable development for their practitioners. This entry was posted in Festival on June 17, 2014 by Carlos E. Webber. Dance is a common experience of all cultures, yet we all express it so differently. Within the Caribbean region, it is fascinating to see how territories have created forms of dance unique to their own experience. Barbados is yet to define a form of dance of its own, but we have embraced them all. Ballroom dancing has long been a favourite pastime of Barbadians. More recently, Latin dance has become very popular, with many clubs formed and an annual competition held. As The Barbados Summer Arts Festival develops, dance will become one of the signature events on our calendar. This entry was posted in Festival on September 18, 2012 by admin. The Hastings Food Fair & Fiesta is one of the elements of The Barbados Summer Arts Festival. It showcases the culinary skills of Barbadian and Caribbean people, offering exposure for those in the cottage industries, encouraging new recipes and celebrating the traditional dishes of the region. One of the elements is the ‘Tastes Like Home’ event and competition, where participants are given ingredients to prepare the same dish, using their own special recipes. A similar competition will be held for the best Caribbean rum punch and to find the island’s ‘proper pudding & souse’ person. The Food Fair and Fiesta is scheduled to take place on Saturday May 26th at the area to the east of the Hastings Rocks Bandstand, on the south coast of the island. This entry was posted in Festival on August 18, 2012 by admin. Barbadians enjoy both dressing up and dressing down. The latter, however, has a totally different connotation here than it does in North America, where it refers to the more casual form of dressing which has become fashionable for the final work day of the week. For us, dressing down is what we do at the Queen’s Park Christmas morning event, a tradition that has continued for decades. In recent years, the mode of dress has become more elaborate, with the men vying seriously for attention at the annual fashion extravaganza. Arts In Motion wishes to highlight both our young designers, who are making waves locally and regionally, and the traditional Queen’s Park strutters, who will vie for the ‘pose-off’ prize. This will be a special treat that will transform the Esplanade area at Hastings into a catwalk for the clash of the traditional and the trendy. For those who may never have gone to the park on Christmas morning, this is an event not to be missed! Barbados has long produced craftsmen skilled in the art of boat-building, furniture-making, and chattel house design and construction. The skill of our tailors is legendary. We have been modest in celebrating these talents, through successive generations. Arts In Motion wishes to call attention to our artisans and is providing a showcase for the expanding range of hand-crafted items, through the Hastings Arts Mart, on Friday, Saturday and Sunday, May 25th – 27th. In the realm of literary arts, Barbados is proud to have produced writers of international repute. George Lamming, Austin ‘Tom’ Clarke and Edward Kamau Brathwaite are three of the best known. The revived literary magazine BIM served as an outlet for literary works from as far back as the 1940s and its reincarnation confirms that the art form is alive and well in Barbados. The Summer Arts Festival is happy to associate with the BIM literary festival, which precedes our festival by a few days. Interest in the visual arts in Barbados has grown steadily over the years, evolving during the decade of the 60s, from somewhat of an underground culture to a vibrant artistic community that includes some 12 art galleries. The advent of the Barbados Community College gave new impetus to the island’s artistic talents. The college’s programmes, along with those of the National Cultural Foundation, private photography workshops and the advent of the digital era, have also led to the dramatic increase in photography enthusiasts. The Festival offers these practitioners another avenue to showcase their talent and to make meaningful connections. 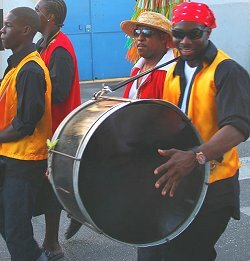 Perhaps the most persistent of the rhythms associated with festivals in Barbados over the years is the rhythm of the Tuk Band. This strolling group of entertainers carried bass and kettle drums, a penny whistle and triangle. They were accompanied by a disguised male figure, dressed as a woman, usually with an extended rear end, which moved to the compelling rhythms. The Tuk rhythm has steadily infiltrated our calypso music. It is the core beat of works by both our veteran exponents of the art form and our younger, emerging talent. Festival will be presenting a big-band concert, featuring the Tuk rhythms, the beat of Barbados, in all its forms, during the Hastings Arts Mart. This entry was posted in Festival on June 18, 2012 by admin.